The scientific environment surrounding the problems of climate change adaptation and climate risk management is evolving rapidly. With changes in research questions (from mean climate towards extremes), the desire for more regional information and the refinement of impact models, past weather data become once again an important resource. New numerical techniques such as data assimilation are now able to use historical observations to produce comprehensive day-to-day weather reconstructions from which further products can be derived. However, vast amounts of weather data have still not been digitised, including in Switzerland. The Swiss Meteorological Network was initiated in December 1863 and maintained by the Swiss Natural Sciences Society and later MeteoSwiss. The Swiss measurements before 1864 have never been systematically explored. However, the climate of the late 18th and 19th centuries might hold the key for better understanding decadal climate processes as this period encompassed a pronounced (still not understood) warm phase around 1800, the coldest decade of the last 500 years around the “Year Without a Summer” of 1816, another cold phase in the 1830s and a period of increased flood frequency in the second half of the 19th century. These periods had implications for the environment (e.g., glacier advance), society (e.g., famine), and politics (e.g., Swiss forestry law), whose study would contribute to better understand climate-society interaction. 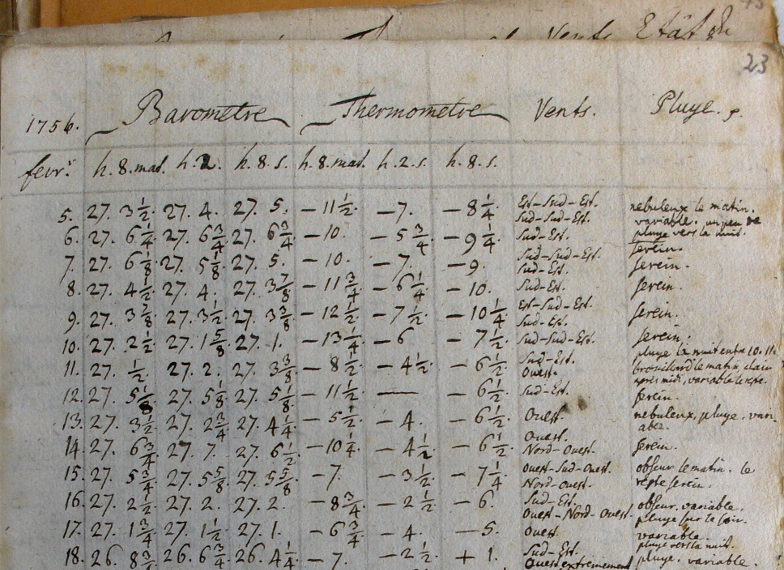 (5) analyse decadal climate variability in Switzerland during the 19th century. The data sets will be sent to several data centres, including the International Surface Pressure Database from which future global reanalysis data sets will be produced. Together with those data sets already digitised and some series in neighbouring countries, the new data series (if their quality permits) will be used to produce daily 2 km gridded weather reconstructions for Switzerland spanning the past ca. 200 years. Two approaches (an Ensemble Kalman Filter approach based on analogs and Reduced Space Optimal Interpolation) will be tested and applied.